Also the abbey church of Vallingegno could have pagan origins, we are talking about a small temple dedicated to the God Genio (Genius), to whom we can refer some rock fragments, used again as ornaments for the abbey. The abbey, one of the most important of the area, is made of a rectangular chamber and of pre-existing structures such as the crypt with square plan and with central pillar. The colonial houses, born afterwards around the court, have occupied the large environments that were originally hosting the workrooms of the monastery. 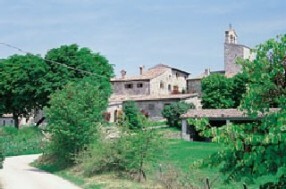 We have documents dating back to the beginning of the 14th century, but presumably even more antique, that testify of the existence, nearby, of the castle of Vallingegno; the castled position and the extension of the view over the valley, up to the road, facilitate his function of protection of the area. Nowadays are still in a good state of preservation the boundary guelph crenel walls and the maestro tower.